Anyone who knows me knows that I am all about the historical fiction these days, and if it contains a duel narrative, even better. No one does this genre better than the three Kates; Morton, Forsyth and Atkinson. It is Kate Morton's work which is most strongly called to mind by the book for today's review, and I'm not just saying that because of the similarities between the cover of this book and the cover of The Clockmaker's Daughter. They even have similar titles! 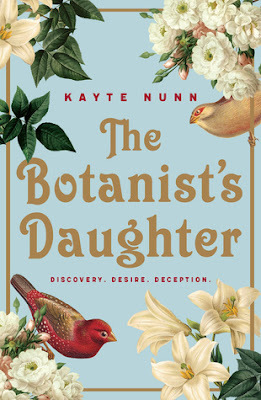 So today, I'll be talking about the book that I spend most of my weekend curled up reading, namely The Botanist's Daughter by Kayte Nunn. Kayte Nunn is the author of two previous novels, but The Botanist's Daughter is her first foray into the historical fiction genre. The novel is a dual narrative historical fiction (again, something Kate Morton does incredibly well), following the story of Anna, a young woman who inherits her grandmother's house in Sydney, and the story of Elizabeth, a young woman living in Victorian Cornwall who is tasked with a dangerous botanical adventure by her famous botanist father. When Anna gets workers in to her grandmother's home to do some work, they discover a diary and a mysterious box, containing seeds, jewellery and sketches. Anna, who has been drifting through her days since a heavily hinted at personal tragedy, feels especially lost at the loss of her Granny Gus, and is compelled to discover the significance of the box and what secrets it might give up to her. The diary tells the story of a young woman named Marguerite, who travelled to Australia in the later half of the 19th Century with an infant named Lily; Anna is desperate to find out what connection Margeurite holds to the contents of the ornate box she has found, and what connection, if any, there is to her grandmother and her house. Meanwhile, the reader is also being told the story of Elizabeth Trebethick, a talented botanical artist in her own right and the youngest daughter of Sir John Trebethick, reknowned botanist. Sir John has lately been preoccupied with a quest for a dangerous Chilean plant known as the Devil's Trumpet, and he is adamant that he should be the one to find it and bring it back to the Kew Gardens instead of his dangerous rival, Damien Chegwidden, who is so ruthless to make his fortune as a plant hunter, he once stabbed Sir John unprovoked. Elizabeth promises her father that she will go to Chile in his place, and so she and her lady's maid set off to Valparaiso about a boat, Elizabeth travelling under her mother's maiden name to avoid catching Chegwidden's attention and arousing suspicion. The novel is paced nicely which makes for a quick and absorbing read, though at times the author's attempts to create cliffhanger endings tended to be somewhat jarring. Generally, the chapters alternated between Anna's and Elizabeth's points of view, though at times we got two of one or the other, depending on what point we were in each narrative arc. The two stories complemented one another nicely in this regard. I was somewhat disappointed, however, with the ways that that stories turned out. Nunn has created two inspiring heroines, who use their respective quests as a means of overcoming grief and finding a new direction for their lives. The ways that their stories end up leave me unconvinced that they will achieve this (and in one case, I am convinced of the opposite, but you'd have to read the book to find out why.) At times, Elizabeth's quest had me thinking of Elizabeth Gilbert's novel The Signature of All Things. I would have liked for her story to have been more fantastical than it was-- there was a sense that the author was holding back and trying not to be too cliche with her twists, but she could have stood to put in a few more. The ending of Elizabeth's story was sad, and unfulfilling, and yes, realistic. Anna's story balanced this out nicely, and there was a sense of history coming full circle, though the closing lines of the novel left me a little confused. There are the makings of a great historical fiction writer in these pages, but unfortunately this book did not totally live up to the expectations I had for it. I still felt absorbed by it and read it non stop for two days, but ultimately feel there were things about it that I wanted done differently. Perhaps in this case, I was not the ideal reader for this book. I gave it three and a half stars.